Apartment completely renovated (2011), air conditioned, fully equipped, very well located, with terrace on the floor of a family home (private access by an outside staircase). The apartment has two bedrooms, one has a bed 160 and the other 140. In the main room there is also a sofa bed. appartement très bien , accueil sympathique , la mer à 100 m , c'était super avec une clim très efficace. Conforme au descriptif et aux attentes. Excelent accueil de la part des propriétaires . Location propre et confortable dans un quartier très calme à deux pas de la plage. Une adresse à conseiller . Die Wohnung war ausreichend groß für 3 Personen. In dem recht kleinen WC wäre ein Fenster sehr gut gewesen. Pro Person gab es nur 2 Badetücher und ein Handtuch. Wir haben das reklamiert, aber leider haben wir nicht mehr Tücher bekommen. Haben uns dann noch welche gekauft und dank der vorhandenen Waschmaschine sind wir über die Runden gekommen. Die Vermieter waren sehr nett und haben uns mit einem Getränk an ihrem Tisch begrüßt. Das Meer mit dem supertollen Sandstrand war wirklich nur 3 Gehminuten entfernt. Da die Geschäfte und Restaurants ca 1km entfernt waren, hatten wir absolute Ruhe. Wir haben uns wohl gefühlt und wären gerne noch geblieben. 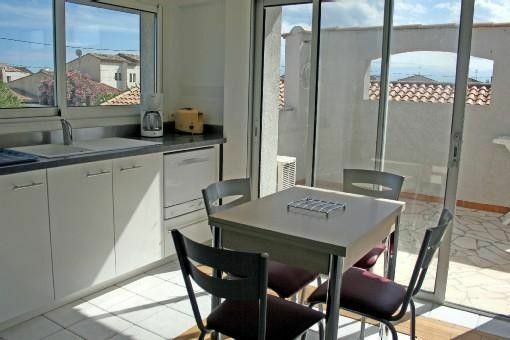 Des hôtes tres accueillants et charmants, appartement impeccable bien équipés et bien placé ! Des supers vacances a recommencé vite !!! We (family with a 7 year old daughter) were very happy with the apartment. The owner and his family are very friendly. Our daughter had a great time playing with the children who live there (and with the friendly dogs, too, they were really cute). The beach is only 1-2 minutes away, depending on how fast you walk, and it's a really nice beach: very clean and looooong and pretty quiet. The water was clear (no seaweed or jellyfish). Thank you everyone, we definitely want to come back! Nous sommes ravis que votre séjour vous ai plu. Notre petite fille a été ravie de rencontrer Maya. Located Frontignan beach 50 meters from the nearest sea port in a quiet area.